The word February comes from the Latin word Februm, which means purification. For gardeners, February should be a time for purification too in terms of preparation of tools, the ground and planting schemes in order to ensure fabulous displays and bumper crops. If you were unhappy with a plants performance last year, ask yourself, is it the right plant for the right place?, if not, have a move around. Think of it as ‘spring cleaning’ for the garden! In the flower garden, wisteria can now be pruned, cutting back side shoots to 2 or 3 buds. By the end of February, summer flowering clematis can be pruned before active growth beings. Trim winter flowering shrubs and climbers to encourage new growth for next year’s blooms. 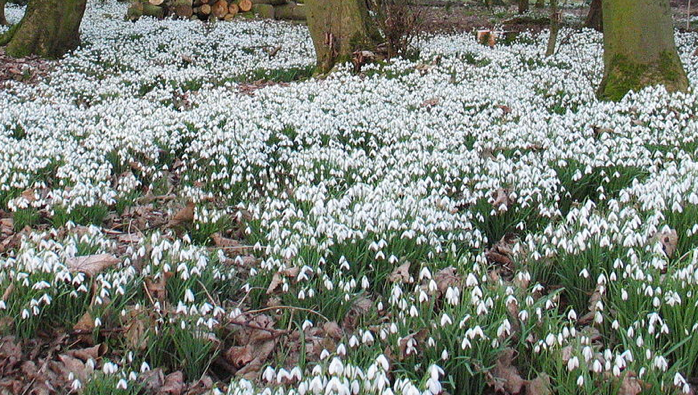 Lift and divide snowdrops while they are still ‘in the green’. Winter flowering shrubs can also be planted at this time of year, so long as the ground isn’t frozen or waterlogged. On the fruit and vegetable plots, rhubarb can be forced by popping a large pot over it, or plant new crowns. The jury is out on chitting, but if you do, now is the time to start with the early varieties of potatoes. In the green house, start sowing vegetable seeds such as leeks and onions. You can sow annuals such as sweet peas, cosmos & poppies, they plug gaps in the summer border very effectively. Leave those Plums alone ! Trees and shrubs that are dormant can pruned and shaped now. It is probably best to leave plum, cherry and apricots until summer though as this prevents silver leaf disease. Finally, if the ground is frozen or it’s just not possible to get outside, consult the new plant and seed catalogues. Now is the time to get ordering for spring deliveries of plug plants and seeds, there is so much to choose from. It’s such an exciting time, planning the new garden/plot or display for 2014. Happy armchair gardening, enjoy!.